Almost every place of business has a need for a Cashier. Usually, Cashiers work part-time and make around minimum wage. That might not be a lot of money, but it’s a solid job if you have other time obligations or you’re just entering the workforce. For many businesses, Cashier duty is an entry-level position, so there are no specific credentials that an employer will expect to see on the resume of a potential cashier. If you’re old enough, potential employers will usually want to see a high school diploma or the equivalent, but still being in school won’t hurt your chances of getting hired. Basic arithmetic and computer skills are expected, which you almost certainly have. Customer service or previous cashier experience is a nice plus, but you can prove your people skills in other ways. 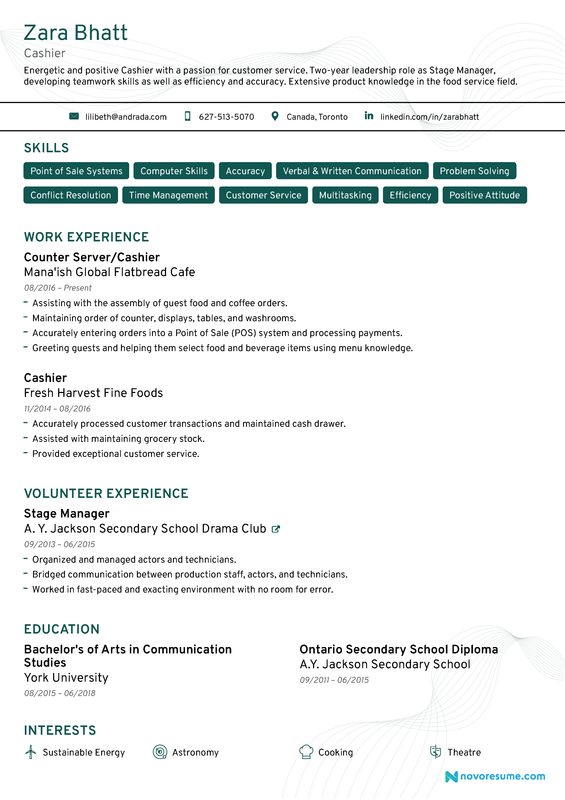 Create a functional resume, which focuses on Skills lists instead of Work Experience. Remember to put down only skills that you actually have and can make a case for in an interview. Since this is a customer service position, remember to include a Soft Skills section—interpersonal skills are essential for jobs like this. Show off your Volunteer experience. Clubs and activities count towards this section and will look especially impressive if you had some leadership role. Even participation in sports shows that you’re capable of teamwork! Older resume guides will say that you should include your full address. This isn’t true anymore (since most employers will contact you by phone or email rather than by post) and will just take up more space that you could be using for other information. Instead, just put your city and region. You might not have a large online presence that would be relevant to a Cashier position, so it’s okay to just include your email and phone number. If you do choose to include a link (like to your LinkedIn page) make sure it’s professional and something that you would be proud to show to a potential employer. Resume objectives are out, and resume summaries are in! What’s the difference? A resume objective tells employers about your goals, but they aren’t very interesting because the employer already knows what job you’re applying for. Instead, use a Cashier summary for your resume to emphasize or include traits and experience that might not show up elsewhere on your resume. Remember that it’s okay to have a short paragraph and use sentence fragments! Positive and helpful Cashier with years of leadership experience as an Eagle Scout. Exceptionally accurate arithmetic skills proven by inclusion in Advanced Placement math courses. Maintains a friendly disposition at all times. I am positive and helpful as well as being an Eagle Scout. I’d like to work for your company because I love math classes and because I’m very good at being friendly. Achieved Employee of the Year Award for excellent customer service 4 months in a row in the last half-a-year. Measurably reduced waiting time for customers through quick and efficient service. Made lots of customers happy.